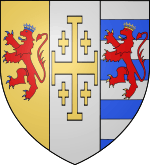 Constantine's arms, a combination of those of Lusignan, Jerusalem, and Cilicia. Constantine II (Armenian: Կոստանդին Բ), (also Constantine IV; Western Armenian transliteration: Gosdantin or Kostantine; died 17 April 1344), born Guy de Lusignan, was elected the first Latin King of Armenian Cilicia of the Lusignan dynasty, ruling from 1342 until his death in 1344. He was a son of Isabella, daughter of Leo II of Armenia, and Amalric, a son of Hugh III of Cyprus, and was made Governor of Serres in 1328 and until 1341. When his cousin Leo IV, the last Hethumid monarch of Cilicia, was murdered by the barons, the crown was offered to his younger brother John, who urged Guy to accept it. Guy was reluctant — his mother and two of his brothers had been murdered by the Armenian regent Oshin of Corycos — but he eventually accepted and took the name Constantine. Isabella (or Zampea=Maria) de Lusignan (ca or after 1333 – in Cyprus, 1382–1387), Lady of Aradippou, married after February 26, 1349 Manuel Kantakouzenos (ca 1326 – April 10, 1380), Despot of Morea.